Allerton Tower Park is another remnant of a wealthy estate owned by a Liverpool baronet, businessman and reputed slaver called Hardman Earle. 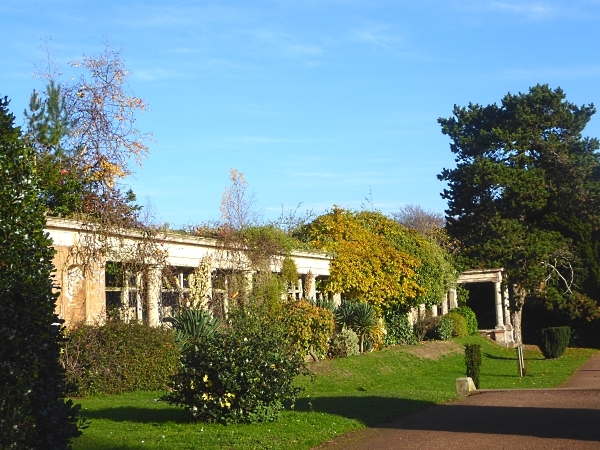 The estate was acquired by Liverpool Council in 1924 and opened to the public. The hall and tower, completed in 1848, were demolished in 1937 due to dry rot, but the lodge, stables, walled garden, former laundry and part of the orangery remain, as well as many mature trees which must be of Earle’s gardeners’ planting. 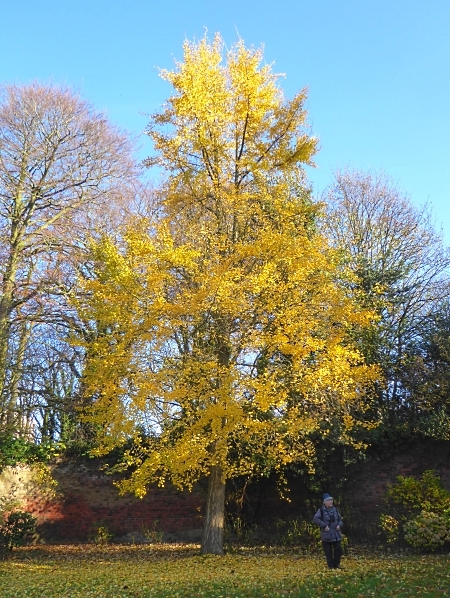 There is a tall Ginkgo in the walled garden, now with golden yellow leaves, which is probably of that vintage. A couple of Cotoneasters were full of berries, so clearly no thrushes have found them yet. There is a stately Holly walk, interspersed with what appear to be old Hawthorn trees. Two of them, near to the orangery, aren’t Hawthorn at all, and may be recent replacements. 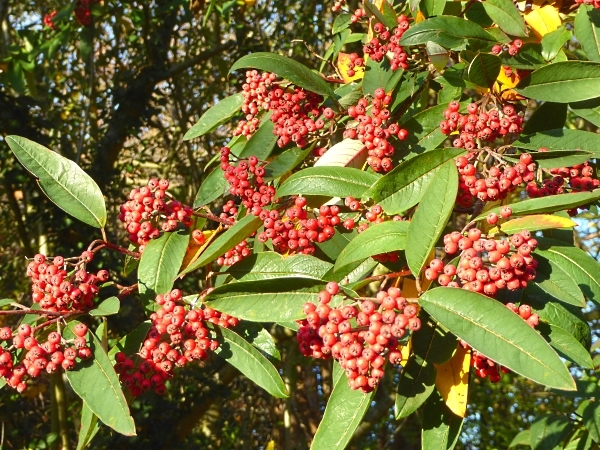 They are covered with large red berries. 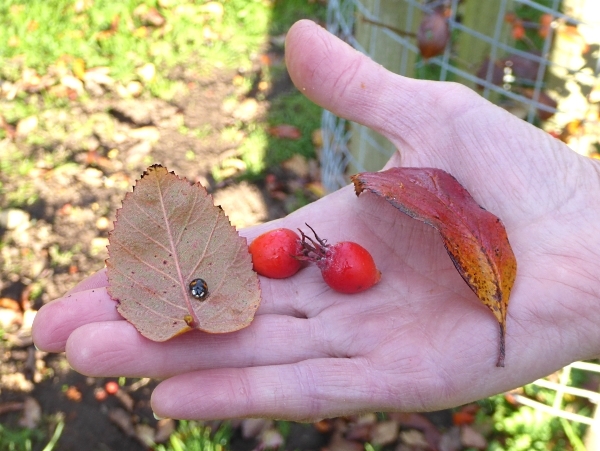 Definitely not Crab Apples, because the fruits had a single stone inside. They look most like Whitebeam to me, with that paler, downy underleaf, but the book says Whitebeam ought to have four or five seeds in the fruit. A mystery. We disturbed a sluggish Harlequin ladybird while we were studying the tree, interrupting its search for somewhere to hibernate. A Sparrowhawk flew overhead, and there were plenty of Wood Pigeons and Blackbirds. A Jay went quickly past, and most of us missed it, but later we could hear it squawking from deep cover. Over the wall of the estate was a tree whose fallen leaves looked like Cut-leaved Beech, but they were probably Turkey Oak. 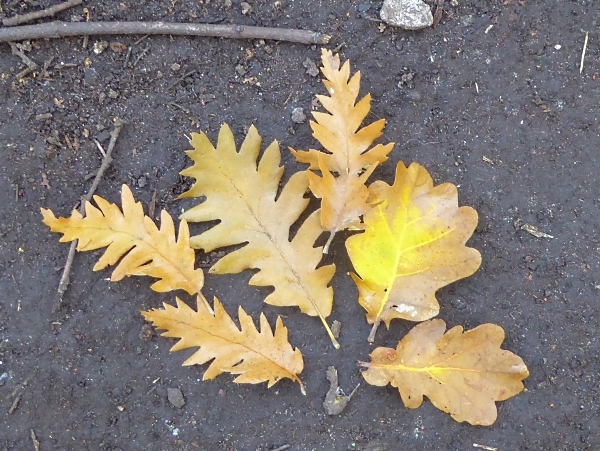 Here they are with some more “normal” Pedunculate Oak leaves, and some spiky Turkey Oak acorn cups from a different tree. 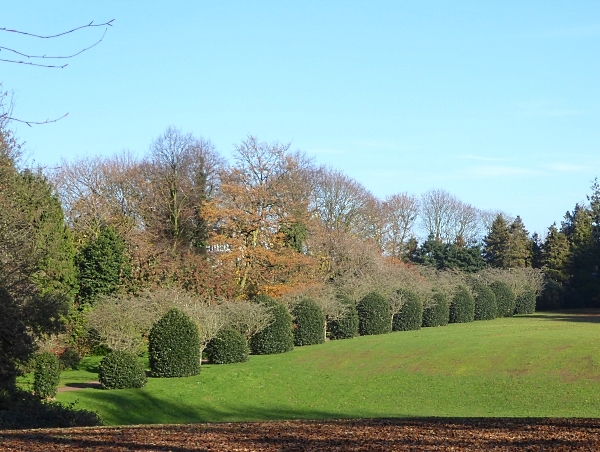 Beyond the orangery is a lawn with several tall trees. 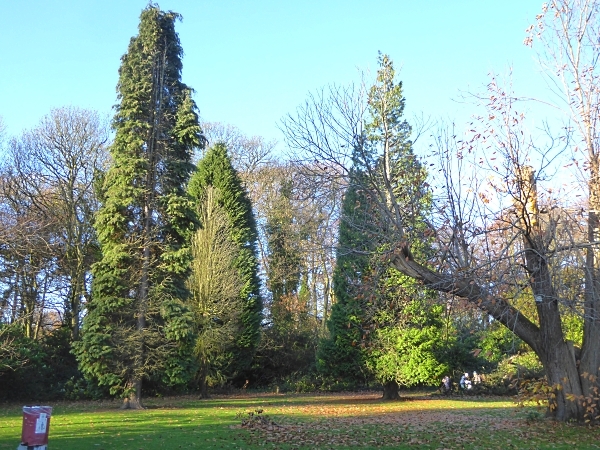 Two of them, which I once thought were Giant Sequoias, are Cypresses, probably Lawson’s. The one on the left was partially burned several years ago, but new foliage is gradually filling in. There is the pruned triple trunk of an old Sweet Chestnut there too, and it is re-growing vigorously and producing lots of nuts. 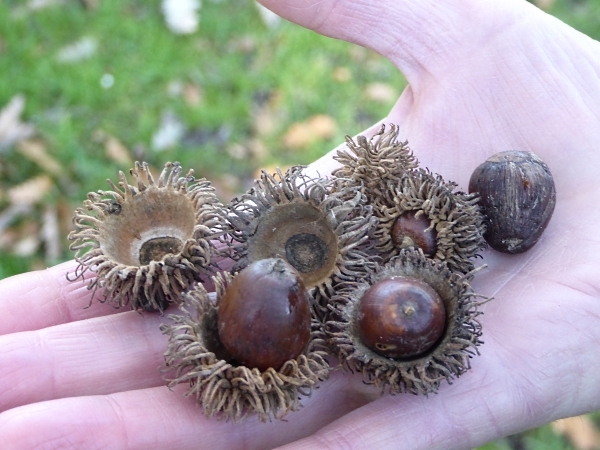 Most of the fruit cases on the ground were empty, but the few chestnuts we found were plump and edible. The foragers have been busy, I think. 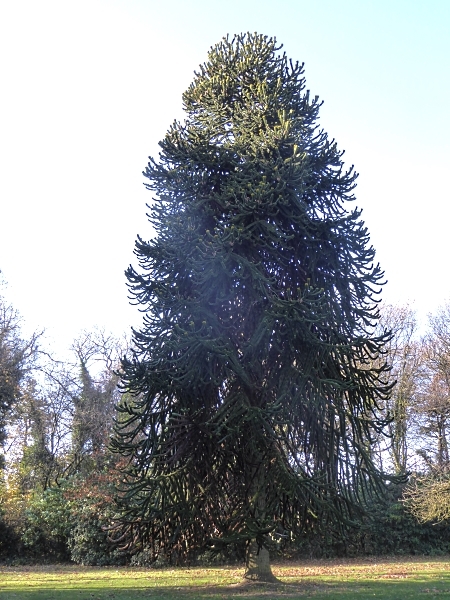 Another tall one nearby is a great old Monkey Puzzle, with branches nearly all the way down the trunk. In the shrubbery nearby was a lot of dead wood, and one log was covered with a white fungus with a frilly edge, looking rather like seashells, several inches across. Some smaller ones were pinker. 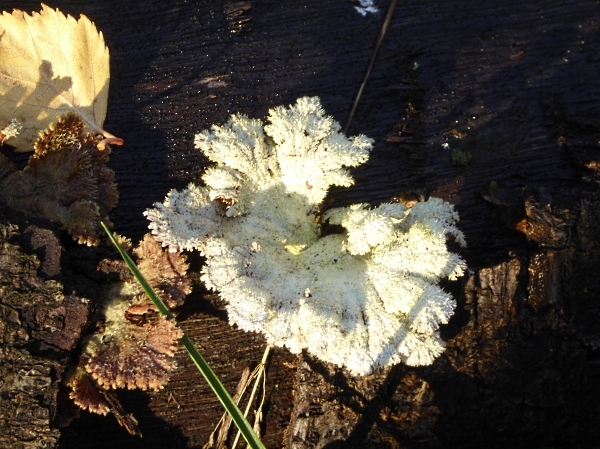 I think it may have been one of the Splitgill group Schizophyllum commune, but that’s just an uneducated guess based on Google images and Wikipedia! It was bright and sunny, but with a sharply cooler breeze. There wasn’t quite a frost overnight, but nearly so. 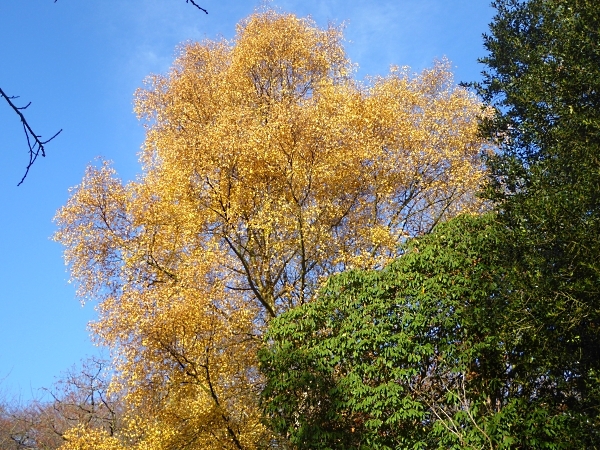 All the red-gold cherry leaves have fallen, but we admired this wonderful Birch, still hanging on to its golden leaves. There were lots of birds in a clump of Hollies, occasionally popping out and crossing a clearing. A female Blackbird, Magpies, possibly the Jay, and our first Redwing of the winter. 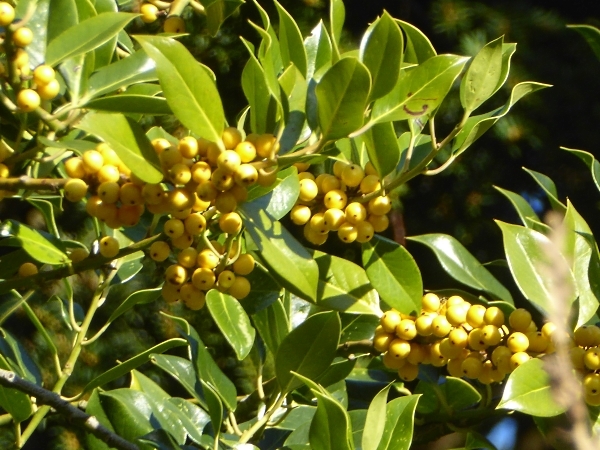 One tree had yellow berries. 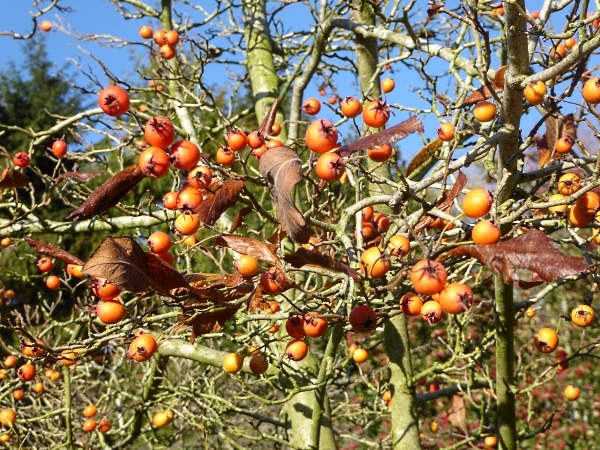 It’s a variety of the common Holly Ilex aquifolium and is called ‘Bacciflava’. I don’t remember ever seeing one of those before. Then to Olive’s to eat our lunch in her warm front room. Ta! Public transport details: 76 bus from Great Charlotte Street at 10.02, arriving Menlove Avenue / Cheddar Close at 10.26. Returned from Woolton Street / Mason Street (Woolton Village) on the 75 bus at 2.05, arriving Liverpool ONE at 2.30.